We used to live in the sticks, so there weren’t many friends around, which meant that I spent a lot of time alone. I would play alone, competing against myself at something, pretending to be multiple different people, usually 3 people. So there were 3 competitors and I would ride my bike, play with some toy or whatever, and compete against myself. Acceptable level of insanity at this point, BUT, I would have a favourite split personality, and if that one didn’t win, I would get mad at myself. So I would be racing something, and then get mad at myself because my favourite’s attempt wasn’t the best. I’m nuts. Anyway, my point is, that for whatever reason, being competitive can lead to positive or negative outcomes, and I don’t quite know what it is that determines which outcome it will be. Losing is a terrible feeling, for me it only really feels bad when I know in my heart I can win, and then I don’t, and specially if I don’t because of my own mistake. It’s such a terrible feeling it makes me want to quit racing at first. And this is where it gets mysterious. Some competitive people will actually quit after some hardships. Others, like me, will somehow get over the worst disappointment, and turn that into motivation, and fuel the fire and decide to try even harder, in order to never feel that bad again. The last 6 years have been a mental beat down and destruction of my confidence and competitive spirit. It’s not that I stopped being competitive, it’s that in my heart I have known that I can’t win. That meant that I wasn’t willing to put in the work as a driver, yes I tried, but I didn’t DO. The difference of “I’ll do my best”, and “I’ll win.” It’s almost like I had to accept defeat mentally, or I would surely have gone completely insane, and most likely quit. With too much on my plate, designing producing, marketing, selling a car, running a company, I just couldn’t improve as a racer at the same time. I had to put my competitiveness on hold in order to survive. And it made me hate life. Finally, this past year, as I started this blog, I made the decision to get back at it, and focus on my driving, and practice so I can go to a race with the mental approach of “I’ll win”, instead of “I’ll do my best.”. I decided to do that because THECar was now good enough to win any race. I knew that with another year of development it would be right up there with the very best, and that I needed to work on my driving to match that. Slow progress is hard to see, so now racing 10th scale in America I can see the progress more clearly. I am now racing and beating drivers who were lapping me in 5 minutes just a year ago. I am now racing and beating drivers who were lapping me in 5 minutes just a year ago. 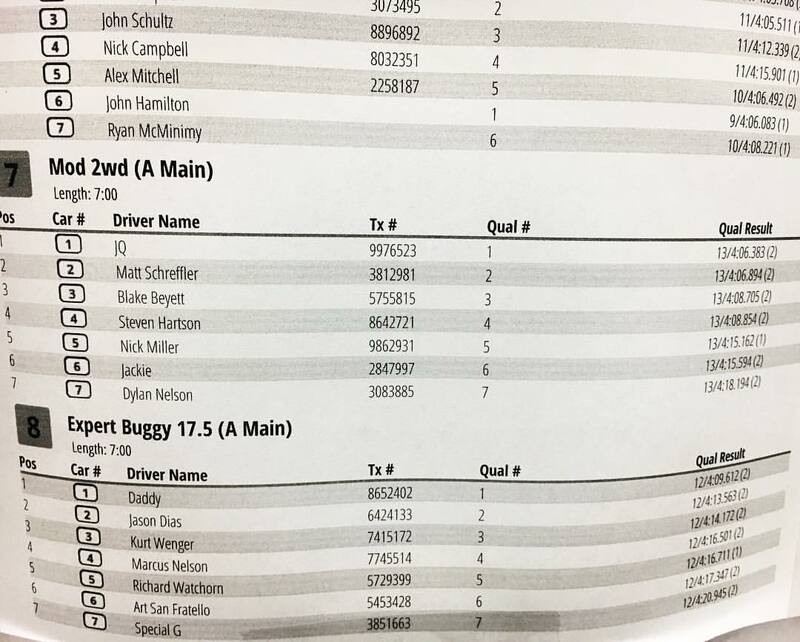 So after tonight’s Wednesday Night Worlds at OCRC, where I TQed over really fast guys like Hartson, Schreffler, Beyett, Thayer, Miller in 2wd, and then went into the main and stuffed it into a pipe on the first lap, going to dead last, fighting back to 4th, but feeling like I just lost a potential win, I got that terrible feeling again. It’s just a club race, but to me when I can win and I don’t, it almost doesn’t matter, it always feels so bad. And this time I realised that this is a good thing. I care again, and I’m so motivated to work harder and win something important one day.